Carly is thrilled to be an HRSA GWEP Alzheimer’s MSW Stipend recipient this year. She is grateful for the opportunity to enhance her skill set to serve the expanding aging population as well as those who provide them with crucial care and support. While the majority of her professional experience has been in youth and family services, several courageous mentors – including a caregiver for someone with dementia and an advocate for elder rights and long-term care reform – inspired her to focus her MSW studies in gerontology this year. Currently, Carly interns with Alzheimer’s San Diego, a local non-profit organization that provides resources, education, and support to individuals and families affected by Alzheimer’s disease and related forms of dementia. In addition to providing critical services across the county, Alzheimer’s San Diego also supports local research for a cure. 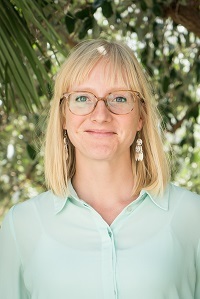 As an intern, Carly will join a dynamic social work team in facilitating support groups, educational programming, and therapeutic interventions for persons with dementia and their care partners throughout San Diego. She looks forward to translating all that she will learn this year as a stipend recipient and intern at Alzheimer’s San Diego to her future career in social work!